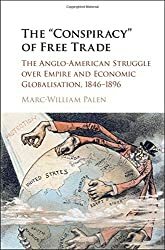 Marc-William Palen’s new book The ‘Conspiracy’ of Free Trade: The Anglo-American Struggle over Empire and Economic Globalisation, 1846-1896 is relevant not only to historians of imperialism, capitalism, and economics, but to the 2016 American presidential primary election. Once again, free trade has become a central campaign issue during a presidential election. While Donald Trump and Bernie Sanders have discussed the consequences of free trade, they have provided very little historical context to help voters understand the rationale behind free trade. Palen’s book explores a world when extreme American economic nationalism came into conflict with Britain’s advocacy of global free trade. Palen’s book focuses “upon the ideological debates surrounding free trade and protectionism” within the United States and Great Britain. Palen is a historian at the University of Exeter. He has written extensively on globalization and free trade for the New York Times, the Australian, The Conversation, Globalist Magazine, History News Network and many others. Palen has recently published two outstanding articles (‘Free trade is once again tearing apart the Republican Party‘ and ‘Trump’s anti-trade tirades recall GOP’s protectionist past‘) explaining how Donald Trump’s economic policies echo previous GOP stances on free trade. He is also the current editor for Imperial & Global Forum. You can follow Palen on Twitter at @MWPalen. Here is the interview with Marc-William Palen. If someone asked you to quickly summarize your book, what would be your 2-minute elevator version? Briefly, The “Conspiracy” of Free Trade provides a new interpretation of Anglo-American imperialism and economic integration from the mid to late 19th century. The issue of free trade dominated the era’s political scene like no other. But whereas Britain turned to free trade as a national policy and ideology by mid-century, the United States turned to economic nationalism. The book thus argues that Anglo-American economic globalization was driven by this political and ideological conflict between free trade and economic nationalism from the 1840s onward. The “Conspiracy” of Free Trade also offers a timely reminder that the Republican Party was, for much of its history, the party of protectionism and imperialism. The GOP dominated the executive throughout most of this period and it viewed any attempts to lower US tariff walls to be part of a vast transatlantic free trade conspiracy to undermine the American economy. The GOP also oversaw the era’s various imperial projects, culminating in numerous colonial acquisitions in the wake of the Spanish-American War. My book explores how this conspiracy-laden ideological conflict over trade policy shaped the imperial course of Anglo-American economic development and globalization throughout the latter half of the 19th century. It would also lay the ideological groundwork for the subsequent US turn to trade liberalization after the Second World War. How would you describe yourself as a historian? Your work crosses several historical fields: economic history, colonial history, diplomatic history, the history of empire, United State history, and British history. How do you see yourself? My particular areas of specialization are US and British imperial history, but I would prefer to describe myself as a historian of ideas – in this particular case, the ideas that shaped Anglo-American imperialism and economic globalization. However, interdisciplinarity is inevitable when writing the history of empires. This is especially the case in the 19th century, a time when imperialism was the principal vehicle for the process of globalization: the global integration of markets and the consequent global diffusion of ideas, people, and products. But there was far from a consensus as to how the United States and the British Empire would approach economic globalization. Far from it. It created divisions and dissent between and among political parties over the proper method for economic integration — free traders vs. economic nationalists, anti-imperialists vs. imperialists — which has drawn me into the field of political history, as well. In hindsight, this was unavoidable because I think it’s fair to say that economic issues dominated late-19th-century politics like no other period in US history. And of course that’s also probably why the period so often gets neglected! The scope of your book is massive. You are tying together Anglo-American imperialism, global capitalism, and economic policy over a 50-year period. When you started researching this book is that what you originally conceived, or did you began to see how these historical issues tied together during the research or writing process? When I began my research, I thought I would begin my story in 1865, and thereby avoid the complicated – to put it mildly – Anglo-American historiographies of antislavery, Westward expansion, and the Civil War. But I quickly realized that this was impossible when I discovered how the ideas that would shape the late-19th-century Anglo-American conflict over economic integration had actually taken root in the 1840s. In other words, the entangled ideologies of economic nationalism and free trade were bound up in antebellum US imperial expansion, Anglo-American antislavery, and Civil War diplomacy. So instead of 1865, I ended up beginning my story in 1846, a pivotal year marked by multiple economic, geopolitical, and imperial events: Britain’s turn to free trade; a temporary US turn to trade liberalization; an upswing in transatlantic antislavery activism; alongside a US war with Mexico and the threat of another war between the United States and the British over the Oregon Territory. As you were researching this book, what surprised you the most? The most surprising discovery was the close relationship between Victorian free trade ideology and transatlantic abolitionism. This led me to answering a question I hadn’t thought to ask: What happened to US abolitionists once American slavery was abolished? Nowadays, historians and political scientists tend to associate American free trade ideology with Jeffersonianism, which became tied to a defense of Southern slavery by the time of the American Civil War. However, what I’ve found is that a number of America’s leading abolitionists—among them, William Lloyd Garrison, Henry Ward Beecher, Joshua Leavitt, Ralph Waldo Emerson—were subscribers to a very different strand of free trade ideology: the Victorian ideology then famously known as Cobdenism, named after Victorian England’s apostle of free trade, Richard Cobden. He and his transatlantic disciples believed that free trade and non-interventionism in foreign affairs would lead to domestic prosperity and world peace. My book therefore recovers the forgotten story of America’s “Cobdenites,” as they were called, and explores how their free trade vision was entwined with the abolition of slavery. For them, free men and free trade were but two sides of the same coin. And so it was that these same antebellum Cobdenite abolitionists would throw themselves into freeing American trade and halting the Republican Party’s imperial policies after the Civil War. What are the core messages that you want your readers to take away from your book? First, the book is a reminder that ideas are important. Second, that to understand Anglo-American globalization in the late 19th century, we have to engage with the very real ideological conflict over trade and empire that dominated the political scene at the time. And third, that these same 19th-century debates over empire and economic globalization laid the foundation for the subsequent international turn to trade liberalization in the latter half of the 20th century. On this point, my hope is that my book encourages people to reflect upon how this earlier conflict over economic integration might inform contemporary controversies over what some now call “neoliberal” globalization; the similarities between the debates then and now are very striking indeed. You have already written a few articles about Donald Trump’s proposed trade policies. Are you stunned that the 2016 United States presidential election would lead to extensive discussions of free trade policies and tariffs? What do you think Americans need to know about tariffs and free trade since it has become a central component of this election? I’m not at all surprised to see free trade coming under fire in a presidential election year; it’s to be expected. Nor am I surprised to see that the presidential debates over economic globalization are largely devoid of historical context. But what does surprise me is that the issue has become such a crucial element within all of the campaigns, cutting across party lines. I think what makes this even more remarkable is that for at least some of the candidates – Bernie and the Donald — their critiques of free trade are more than populist posturing during an election year. In contrast to Hilary Clinton or the other Republican candidates, I think that Sanders and Trump mean what they say when they call for a new trade regime. If either one were elected president, I believe they would seriously attempt to change the course of US trade policy. Regardless of where one stands on this issue, this is important because it holds forth the very real possibility of the transformation of American – and thus global – economic integration in the very near future. What do you think would happen if the United States tried to unring the bell of free trade and passed meaningful tariffs against some of its largest trading partners? Could this endanger the United States’ recovery from the 2008 economic crisis? History is no crystal ball, but America’s protectionist past ought to provide a useful glimpse into what might occur under a Trump presidency. As I’ve touched upon elsewhere and have explored to some extent in The “Conspiracy” of Free Trade, the long history of Republican protectionist policies is in no small part a long litany of tariff wars between the United States and its trading partners. Whether or not the benefits outweigh the costs, I will leave to others to debate. But past precedent should inform current policy, a rule that I try to follow in my commentary, in my research, in the blog I edit, the Imperial & Global Forum, and in a new History & Policy initiative – The Global Economics and History Forum – that I’ve just launched with Andrew Dilley and my colleague David Thackeray. Finally, how do you think that The ‘Conspiracy’ of Free Trade could best be used in a history class? What types of classes would it work best in? I think it would be ideally suited for graduate and advanced undergraduate classes on the history of globalization, British imperialism, and the US and the World. I purposefully wrote the book so that it would be accessible to students of empire and globalization, but who might not have been exposed to very much economic history or terminology. Also, because of its clear intervention in longstanding debates within US imperial historiography and its engagement with contemporary debates over globalization, it should, I hope, work well in sparking debates in the classroom.